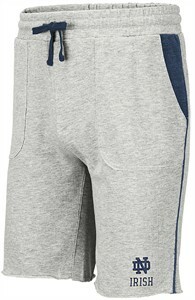 These Notre Dame Fighting Irish Mens Heather Grey Medellin Shorts let you show off your team pride at the gym or on a run and keep you comfortable with a relaxed-fit that has an outerbody made from 8.11 Oz. 55/45 Cotton/Polyester and an inner lining constructed from 100% Space Dye French Terry Cotton material. Features include side pockets, an elastic waistband with an internal drawcord for a comfortable fit, a 10 inch inseam, and to show off your college pride a left hem distressed screened Notre Dame logo.